Chicago Torture Justice Memorials (CTJM) is a collective of artists, activists, and attorneys that organized for, and won—in alliance with We Charge Genocide, Project NIA, Amnesty International, and Black Youth Project—historic Reparations legislation for African Americans tortured by Chicago police. Please join the UCSC Art Department and SPARC in welcoming Federico Cuatlacuatl for a discussion about his socially engaged projects and the Rasquache Artist Residency which he initiated in Cholula Mexico in 2016. Lecture and informal discussion, 12:30-2pm, Wednesday October 12th, 2016 in the Semiar Room, Baskin Visual Arts, UCSC. SPARC fellow and Art Dept Visiting Artist Michaela Leslie-Rule will present a public talk and workshop on Feb. 25 and Feb. 26, 2016. Michaela Leslie-Rule designs research and cultural documentation projects that use storytelling, photography and videography to elevate marginalized voices and stories. Over the past decade she has used her ethnographic media-based approach to examine issues of racial and cultural equity, public health, women and girls’ economic advancement and empowerment and masculinity. The sound art collective, Ultra-red has engaged communities for twenty years as artists, organizers, and social researchers. Ultra-red’s strategies focus on what and how we hear and are heard. We invite members of the community as active social agents to join in a dynamic series of events of participatory political listening and conversation. SPARC and UCSC's Institute of Art and Science host Harrell Fletcher, Molly Sherman, and Nolan Calisch, members of Public Doors & Windows, for a lecture about their recent projects and an upcoming collaboration with the Center for Agroecology at UCSC. Thursday, January 16th, 5-6:30pm, DARC 230.
join SPARC in welcoming Dr. Nathalie Blanc, the director of Research at the French National Center for Scientific Research, for a off-campus lecture at the home of SPARC Fellow Barbara Benish. Dr. Blanc will deliver a lecture titled "Aesthetics and Environments: Interdisciplinary Issues" followed by a discussion facilitated by Barbara Benish about her project the SS Palo Alto art park, which seeks to teach visitors to Seacliff State Beach about ocean sustainability. Ms's. Blanc and Benish are currently co-authoring a book on Art and the Environment. Members of the Beehive Design Collective present their most recent banners and discuss their long-standing strategies to work as "translators of complex global stories" throughout the Americas and beyond. November 13th, 2013, 1-3pm, DARC 108. Ultra-red members Dont Rhine and Leonardo Vilchis kick off their 2013-2014 SPARC Fellowship with a Brown Bag Lunch Lecture and Listening Session. Noon-2pm, Wednesday March 6th, DARC 206. 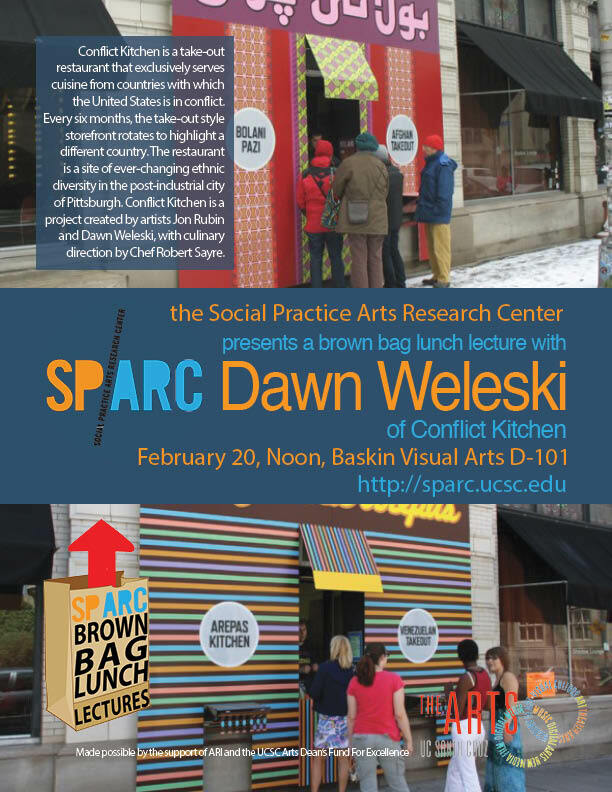 SPARC presents Dawn Weleski of Conflict Kitchen, Wednesday February 20th at Noon in Baskin Visual Arts D-101. Working group discussion about proposals for the SS Palo Alto-- a concrete ship that, anchored at Seacliff State Park, forms a pier. A participatory art work and symposium on ethics happening at the Santa Cruz Museum of Art and History with Artist Fellow Kristaps Gulbis, UCSC students, the Social Practice Arts Research Center & the University Of New Mexico’s ISP Program. May 11th, 2012. 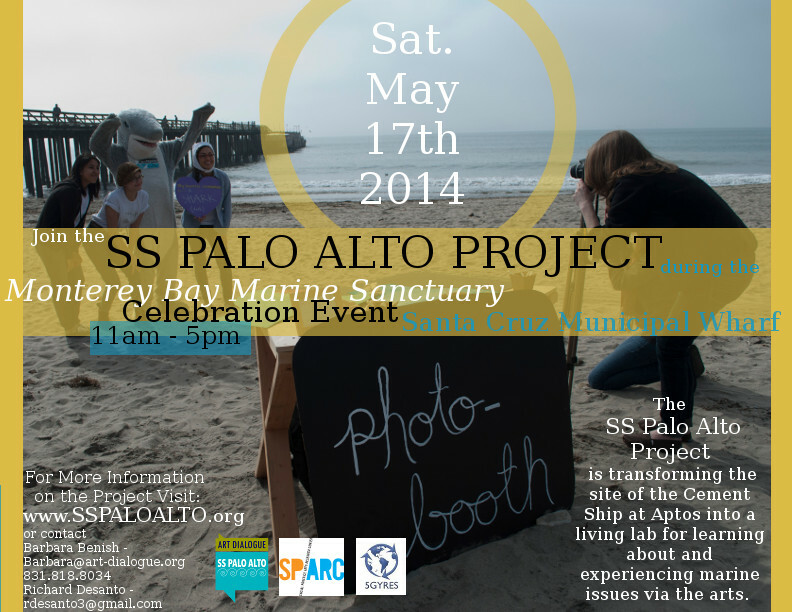 Join us for a discussion about how an ArtPark on Seacliff State Beach's "Cement Ship" can help raise ocean awareness. October 24th, 2012, Baskin Visual Arts Seminar Room, UCSC, 10am-1pm, with workshops and site visit to follow. Affiliated artists and invited guests dedicated an intensive day of dialog to questions of the ethics of social practice. UC Santa Cruz's Social Practice Arts Research Center fosters knowledge exchange and project building between artists, scientists, the public and others with a vision towards active social and environmental change. Working across disciplines, we aim to engender and support collaborations and projects that have a local, national or international impact on the public sphere. © Copyright 2012 by SPARC. All rights reserved.